Main Street/Mount Pleasant is located south of downtown on the east side of Vancouver. Visitors will enjoy exploring all of the unique shops in the neighbourhood, especially if you enjoy antique furniture, and quality vintage consignment clothing. The majority of the notable shops and restaurants in the area are between East 5th and East 30th Avenue. The area around the Main Street and Broadway intersection is known to locals as South Main, or “SoMa”. – Take the 19 Metrotown Station bus from the corner of West Pender and Thurlow heading Eastbound. Get off at the corner of Kingsway and Broadway. – From Vancouver City Centre Station (located on Granville between Georgia and Robson), take the skytrain from the platform marked “Canada Line to Richmond-Brighouse” and get off at “Broadway – City Hall Station”. At the corner of Broadway and Cambie, transfer to the 99 Commercial Broadway Station bus heading Eastbound. Get off at the corner of Broadway and Main. – From Vancouver City Centre Skytrain Station (located on Granville between Georgia and Robson), take the skytrain from the platform marked “Canada Line to Richmond-Brighouse” and get off at “Broadway – City Hall Station”. At the corner of Broadway and Yukon, transfer to the 9 Commercial Broadway Station bus heading Eastbound. Get off at the corner of Broadway and Main. – From Burrard Skytrain Station (located on Burrard between Melville and Dunsmuir), take the skytrain from the platform marked “Expo Line to King George” and get off at Main Street Station. At the corner of Main and Terminal, take the 3 Main bus headed Southbound. Get off at the corner of Main and Broadway. – From Burrard Skytrain Station (located on Burrard between Melville and Dunsmuir), take the skytrain from the platform marked “Expo Line to King George” and get off at Main Street Station. At the corner of Main and Terminal, take the 8 Fraser bus headed Southbound. Get off at the corner of Kingsway and Main. Mount Pleasant is home to many young families, young professionals and hipsters. Since the early ’90s, the neighbourhood has undergone a process of gentrification, and is currently considered one of Vancouver’s up-and-coming areas to live and play. The area has many independent owner-operated small businesses, including antique/consignment furniture stores, vintage/consignment clothing shops, and a multitude of unique cafes and restaurants. SoMa is also home to a number of artists and writers. Body Politic (208 East 12th) Stylish sustainable fashion boutique offering a solid selection of eco-friendly designer fashions from Canada and the US. Everything from trendy jackets and accessories to the cutest baby outfits. The Archetype (2549 Main) The Archetype is my go-to spot when I am seeking out playful and unique pieces for good value. Last summer, I picked up a beautiful wide-rimmed hat to wear to the horse races for only $30! Wonderful and quirky fashions for both the ladies and the gents. Barefoot Contessa (3715 Main) This boutique has been rightly voted the Best Independent Women’s Clothing Store for the 3rd year in a row by The Georgia Straight. In my humble opinion, it is the best place in the city if you are looking to find something pretty. Choose from a selection of the most feminine dresses, tops/bottoms, shoes and accessories. Twigg and Hottie (3671 Main) Edgy, funky, beautiful and unique are all words that describe the pieces you will find here. The garments have been meticulously selected from over 50 Canadian labels, designer brands and independent designers. Be sure to check out their three in-house labels – Twigg & Hottie, Michael Clothing, and Clementine Clothing. Baker’s Dozen Antiques (3520 Main) Everything from antique toy collections, furniture and decor, paintings, photographs, signs and much more! Maynard’s Fine Art & Antiques (1837 Main) Well-established fine art and antiques auctioneer and appraiser. Don’t forget to go next door to check out their retail store. ReFind (1849 Main) Fantastic selection of locally sourced antique, mid-century and modern furniture offered at reasonable prices. Check out their website for photos of their “Fresh Finds”. Open from noon-5 daily and closed on Tuesdays. Neptoon Records & CDs (3561 Main) Neptoon Records is Vancouver’s oldest independent music store, offering the largest selection of used and new vinyl in the city. They also have a large collection of CDs, concert posters and memorabilia. Habit Lounge (2610 Main) Fresh modern Canadian comfort food served in a modern setting. Offering weekly dinner specials, brunch on weekends and a solid wine and cocktail list. 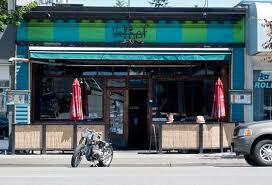 The Reef (4172 Main) Contemporary Carribean cuisine served in a casual atmosphere. Many of their dishes come with your choice of meat, which include chicken, pork tenderloin, salmon, prawns and goat. Tofu and ital are available options for vegetarians and vegans. Great beverage list including ginger beer, sangria and a variety of cocktails. Nyala African Cuisine (4148 Main) A diverse selection of African cuisine from Ethiopia, Morocco and South Africa prepared with locally sourced ingredients. An excellent selection of wine and beer from South Africa and BC. The service is friendly and there is live music every night of the week! 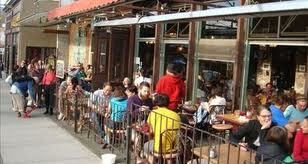 The Whip (209 East 6th) Tucked away on a side street, this popular locals hang-out is easy to miss. With their delicious organic fare and comprehensive selection of craft beers and martinis, you won’t want to make such a mistake! Voted the #1 East Van Pub by the Courier’s People’s Choice. The Locus Cafe and Lounge (4121 Main) – An eclectic fusion of modern and classic favourites. The Locus is a popular spot for brunch on the weekends. The ingredients are fresh and the service is friendly. Good coffee too! Hawker’s Delight (4127 Main) – This quintessential hole-in-the-wall eatery is known to neighbourhood residents as a great spot for delicious cheap eats. Offering Singaporean and Malaysian favourites such as nasi goreng (fried rice), laksa (coconut curry broth based noodle dish), and satay (meat skewers). The interior is very bare bones and the experience really is all about good food for good value. Pho Tan (4598 Main) – This is my favourite spot to go for Vietnamese rice noodles. The pho comes in a delicious lemongrass flavoured broth that has been prepared over many hours, and the lemongrass chicken is fragrant and tender. Some of my favourite items are not offered on their menu, and to be safe, I suggest calling to order them ahead of time. Ask about their BBQ lamb chops, which are served with your choice of fries or bread, and the clay pot crab which is cooked in beer. Ask for a side of noodles to eat with the remaining broth. Au Petit Cafe (4851 Main) Great place for Vietnamese subs (or “banh mi”). They come on fresh French bread with sweet pickled vegetables and your choice of meat. You can’t go wrong for $4-5! If you like your coffee strong, make sure you order a glass of their dark French iced coffee with condensed milk. Liberty Bakery (3699 Main) – Cafe/bakery serving delicious homemade soups, sandwiches, breads, cookies and other pastries. My favourites are their black bean with lime soup and their paninis. They also have this pastry called a “potato”, which is actually a delicious marzipan treat – yum! JJ Bean (3010 Main) JJ Bean is a local company that roasts and serves their own coffee. Their Main Street location has a beautiful interior and is often packed to the brim. They offer a small selection of sandwiches, muffins/scones and cookies. Wifi access is available. The Cascade Room (2616 Main) This lounge is in my top three favourite spots to have cocktails with friends. The food is good and they also have a comprehensive selection of local and imported beers. The Five Point Restaurant and Pub (3124 Main) Great spot to meet with friends for food and drinks. Cafe Montmartre (4362 Main) – Parisien cafe featuring weekly live music, spoken word and actors improv. Don’t miss their house-special crepes! There are a number of designated bikeways in the neighbourhood. Also check out Riley Park about one block west of Quebec Street on East 30th Avenue. Mount Pleasant Community Centre (1 Kingsway at Main) – Community centre offering programs for all ages, licensed child care services, fitness facility and room rentals. Mount Pleasant Farmers Market (East parking lot of Nat Bailey Stadium at 30th and Ontario) www.eatlocal.org/markets.html – Farmers market taking place during the summer and winter months. Check the website for dates and more!